We get asked the difference between the different white LED color temperatures all the time. The answer is fairly simple when you understand the basics of how the color of light is characterized. For the sake of keeping the topic to LED lighting, only the colors that are typically used in LED lighting will be discussed. Color temperature is primarily a STYLE choice but the human eye does perceive a whiter light as being brighter. The image below (view full size) shows a side by side comparison of our three choices. It's ultimately up to you and depends on what you're trying to achieve with the lighting on your vehicle. The higher kelvin number DOES NOT mean the LEDs are brighter. What are the main differences between the color temperatures of light? Take a look at the Planckian locus graph below (click to view). The main area to pay attention to is the black curved line inside of the colored area. As you can see on the graph, 3000, 4000, and 6000 numbers are all shown. This range contains the most commonly available colors of LED lighting for headlights, parking lights, and fog lights. Can I get a perfect match to my HID or existing LED bulbs? It's impossible to get an EXACT match of color temperature of bulbs. This is because of variations in the manufacturing of HID and LED products. An example of a slight variation is our V6 Triton system which uses a CREE LED chip and our Series 17 bulbs which use a proprietary LED chip. Although they are very CLOSE in color, they are not a perfect match. Most people do not notice this difference in typical applications because vehicles rarely have bulbs right next to each other. Another thing to remember is that other LED sellers will say their LED's are 6K, but we have found they're more of an 8K color which tends to be blue/purple. The only way to make sure that you get the closest match is to buy all of your LED products from the same company. As seen on the graph, 2700 kelvin lighting is the average color of stock halogen/incandescent bulbs. It's slightly less white than 3000K but it still has an ORANGE/YELLOW tint. Many of our customers are trying to upgrade from this color of bulbs as they feel that it makes their vehicle look more dated than it is. As seen on the graph, 3000 kelvin is typically a yellow color. This color of lighting is most commonly found in fog lights in order to have a distinct color difference when compared to the headlights. It also helps increase visibility of a vehicle when viewed by other drivers. As seen on the graph, 4300 kelvin is the color of most stock HID systems. It's far more white than 3600K but it still has a very slight YELLOW tint. While more modern than 3600K, some customers still find that the 4300K isn't cool or blue enough. As seen on the graph, 5000 kelvin is a nice white but has a slight tint of yellow. People who choose this color are usually trying to get a more natural white light that appears less harsh to the eye. As seen on the graph, 5500 kelvin is the purest WHITE color temperature available. There is no yellow or blue tint to the light output. It's a very neutral tone wich blends well with other colors. As seen on the graph, 6000 kelvin lighting falls between white and BLUE side of the graph. People who choose this color are usually trying to get an exotic, more luxurius look. Even though the difference is slight when they are viewed side by side the color of 5500K and 6000K LED bulbs are obviously different. What's the easiest way to remember which color is which? Now that you understand how color temperature looks on the graph the best thing to do is to remember that the lower the number the more YELLOW or ORANGE the light appears. The higher the number the more BLUE or PURPLE the light appears. 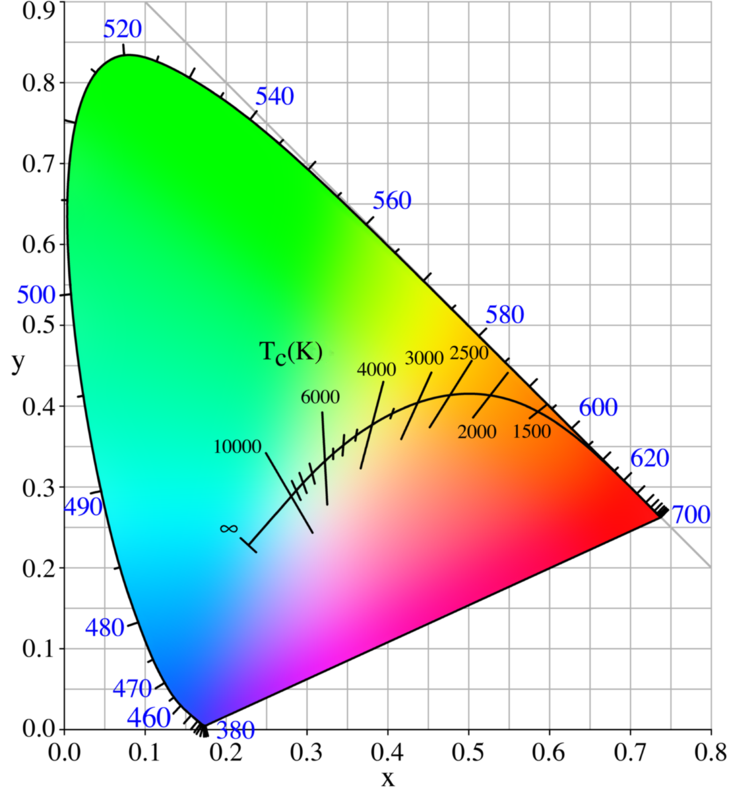 Color temperature graph courtesy of Wikipedia.